Fly into the sprawling city of London and hit the road straight away when you book a Gatwick Airport car rental in advance on Airport Rentals. Navigating the terminals is a breeze when you have everything organised in advance, so pre-book your wheels and start your trip in no time. London awaits - and a car hire is the best way to see it. 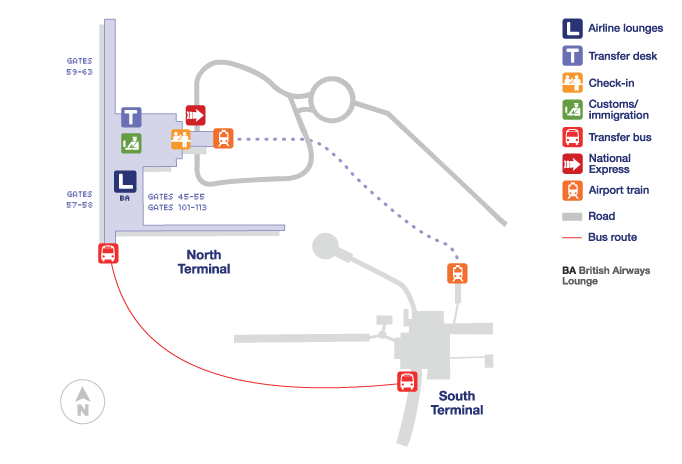 In Gatwick’s North Terminal and South Terminal you will find car rental counters for a number of international rental brands and there’s a huge range of what’s available at Airport Rentals. Don’t spend hours searching online – our simple search and booking engine means no time wasted. Just enter your details then compare, decide and book. Make a shortlist of the ideal vehicles for your Gatwick Airport car hire with the helpful filters. Choose the class of vehicle, the transmission type, number of passengers and more to pinpoint the perfect rental car. The price is always an important consideration for a rental car. Airport Rentals has a team always working on getting the best prices to pass on to Gatwick Airport customers, so you can be assured that you are getting a great rate when you book on the site. This is backed up with a lowest price promise - see the “About Us” page for more details. Find additional discounts on the homepage where the day’s special offers and mystery deals are displayed. Once you have picked up your car hire from Gatwick Airport, the lovely land of Great Britain is waiting. London is likely to be your first stop – a wonderful, multicultural and slightly eccentric city where you could spend weeks without seeing everything. From the airport, take the M23 to head into the city. Beyond London lies England, and beyond that are Scotland and Wales, all easily reachable by car. Set your own itinerary and explore whichever region takes your fancy! Go south-west for the beaches and villages of Cornwall, or take in the lonely landscapes and beautiful coastline of Wales. The north has plenty of cities to explore, along with some stunning natural features - favourites are the Peak District National Park and Lake District National Park. Scotland is a simply amazing destination, with soaring mountains and quaint farmhouses as far as the eye can see. Edinburgh, Glasgow, Aberdeen, Perth (for the Australian Perth and the car rental on offer follow the link here) and other cities mix Scottish charm with worldly sophistication. The freedom of a car rental from Gatwick Airport makes it a great way to travel, so be sure to make the most of your time in the United Kingdom. London Gatwick Airport is 5km north of the centre of Crawley and 47.5km south of central London. It is London's second largest international airport and the second busiest in the United Kingdom.